Formula 1. This year particularly, this sport has been in the midst of a whole host of stories. Last year, the championship was won by Hamilton, on account of points, though Massa won more races. Lots of people criticized this turn of events and me and my blog were no exception! So this year saw a change in rules! Again, these rules were flailed by many. Then a new team came along - Brawn GP, and swept entrenched players and race winners off their feet. As if that were not enough, cut to Hungaroring. A spring weighing 0.65 kg, flies from Barrichello's car, hits Massa's helmet in the most gruesome, freak accident in a long time. The incident triggered morbid pictures of Ayrton Senna, another Brazilian, whose accident is the only case of a casualty on track in F1. The parallels were way too many. Similar mode of injury, only that in Senna's case the accident had dire consequences. In Massa's case, one must say that it is indeed a miracle that he survived. But look at Ferrari from a more holistic point of view. Ever since Schumi left the team, the team has almost sort of lost out a lot! First Brawn left, then last season was a disaster, thanks to Massa losing the championship by a meager point. As though that were not enough, this time around, though Ferrari and Massa were not in a very strong position championship-wise, Massa suffered a near-fatal accident, that knocked him out of action for goodness knows how long. Sounds a lot like Ferrari of 1999. 20 years of having run without a single championship victory, they were sooooo close to victory that year with Schumi, till the accident at Silverstone that broke Schumi's leg and knocked him out of the championship that year. But things cannot be all bad all the time! So, Schumi came back after his injury in 2000 and won all championships thereafter. One of the best periods in F1, at least for me, since I got to see Michael magic time and again, and I got to see a piece of history being made! And now, HE IS BACK... He will drive for Ferrari for the remainder of the season - 7 races in all, beginning with Nurburgring - the European GP. As an ardent Schumi fan, I couldn't have asked for more. I quit watching F1 this season, since there really was no one to cheer for. When Schumi raced, victorious Sundays were happy. The following Mondays would have me dressed in red while going to college. Sundays without Schumi on the podium were days when people were better off not talking to me. Such was the admiration I had for his talent and his sportsmanship. All hail the return of the king. 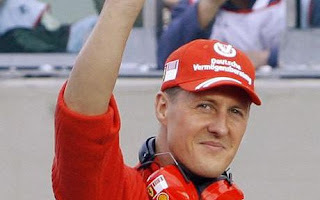 Schumi thanks for coming back. Hope you add a touch of your magic to an otherwise forgettable, drab season in F1.